1 Firefighter Taken to Hospital After Battling 4-Alarm Fire in Salem, Mass. Investigators are trying to determine what caused the fire to break out at an apartment building in Salem early Saturday morning. 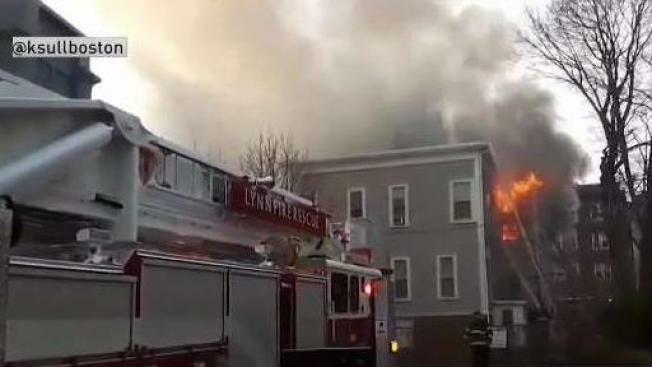 One firefighter has been hospitalized for minor injuries after battling a 4-alarm fire in Salem, Massachusetts. The firefighter was transported to the hospital for heat exhaustion following the early Saturday morning blaze. Investigators are trying to determine what caused the fire to break out at the 12-unit apartment building on Lynde Street. "It was just smoke in the halls and it spread through the building," said resident Corliss Thornhill. The fire is believed to have started in the basement after reports of heavy smoke coming from there around 6 a.m.
Thornhill noticed the smoke, got out of the house and called the landlord. Once outside, he realized a massive fire had engulfed his home. "Then it spread to the back wall down the driveway and it spread across the back of the house and was coming out of the side of the house," Thornhill said. Every resident in the building was safely removed, but will be displaced as a result of the fire. No residents were injured. One resident in the building attempted to put out the blaze with two different fire extinguishers before calling 911 and assisting in getting people out of the building. The building did not contain sprinklers and is made of wood, causing the fire to spread quickly. Smoke detectors in the building were working, however. "Smoke detectors got everybody out of this building," said Salem Fire Marshal Lt. Peter Schaeublin.